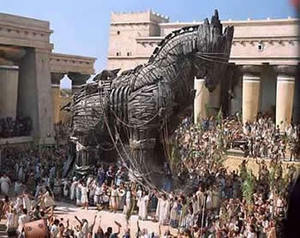 The Trojan Horse, the symbol for being fooled by an outward show and appearance, letting down one’s guard, and bringing the enemy inside. Not far from what the world is experiencing today with the rule of psychopaths: intraspecies predators who look like normal humans but are not. We had just made an international move and were waiting in our new house for our delayed shipping container to arrive with our library. I was quite at loose ends without anything to read when this book arrived in the mail, sent by a friend who knew I was without books. I can tell you that, after reading the cover, if my library had been there, I would never have read it. “Stuff and nonsense!” I snorted! Who was this guy to suggest that Troy was not close to Greece, that all the scholars were wrong? Well, it’s really a good thing I didn’t have anything else to read! So many questions answered! Most people are not aware that not one of forty characteristics of the City of Troy and the Trojan War plain fit the Mediterranean setting. What is astonishing is that the author of the Odyssey does give ALL the information needed to exactly place where Troy Once Stood! * The Achaeans built 1186 ships for their attack on Troy, they could have travelled the short distance overland far quicker and cheaper if Troy really had been in the Turkish setting. * Odysseus claimed to have got home by travelling as a passenger on a ship going from Crete to Sidon (present day Saïda in Lebanon), but that is the opposite direction he needed to go in the Mediterranean setting. * Agamemnon tells us it took him a full month to sail from his kingdom Argos to Ithaca, we know the trip takes less than 24 hours in the Mediterranean setting. * The mythical location for Troy in Turkey is far too small to accommodate the invading army of about 100,000 men and the long pursuits in horse-drawn chariots. * The extensively travelled Greek geographer Strabo who lived 2000 years ago (1200 years after the Trojan War) believed that some of the ports of call in the Odyssey should be found in the Atlantic because of the mention of tides that do not really exist in the Mediterranean. Well, what really baked my noodle was the part about the rivers. Language and how it morphs over time is a particular interest of mine and Wilkens showed that he knew his stuff. The plains near Cambridge and the Gog Magog Hills is a place where more than 12 rivers mentioned in the Iliad can still be recognised by name even today. “There has come to be an abundance of empirical evidence that the world Homer wrote about did exist. In an even older work “Troje lag in Engeland: Odysseus landde in Zeeland” (translated: Troy lay in the United Kingdom: Odysseus landed in the Netherlands) Ernst Gideon followed the work of the 18th and 19th century Belgium authors De Grave and Cailleux, who took pains to show that Troy was located in England and that the Odyssey took place in the Atlantic Ocean and the English Channel. Like Iman Wilkens, Ernst Gideon realized that the ocean Homer wrote about is wide, wild and dangerous, never smooth and sunny, the color was gray and never blue, and such an ocean could not have been the Mediterranean sea. In short, the weight of the EVIDENCE makes it quite clear that Troy and the Trojan War did not occur in Greece and Turkey (as we know it today), but somewhere else. The fad for all things “Egyptian” has been with us for a very long time. The fact is, the Egyptian civilization that we know from archaeology, epigraphy and documentary evidence, was static and limited. What’s more, it caved in on itself, and never managed to produce any significant work of benefit for humanity, as Otto Neugebauer showed conclusively in his “The Exact Sciences in Antiquity”. The open-minded thinker ought to really consider the purported mysteries of the Egypt that we know in terms of the fact that they were so ignorant that they devoted a huge amount of energy to their “cult of the dead.” The whole Egyptian shtick is focused around preserving dead flesh for future or otherworldly reanimation. The very fact that there are so many of these dead bodies for Egyptologists to dig up is the clearest evidence that the beliefs of the people we now consider to be the “Egyptians” were nonsense. The whole issue of the excitement over Egyptian civilization is the belief that they had some mysterious powers because they built the pyramids and we can’t. It has even been suggested that it was not the people we now know as Egyptians who built the pyramids. Also, has it never occurred to anybody that the existence of the pyramids in conjunction with the worship of an elite group of human beings, while everybody else was wearing loincloths and sweating in the hot sun, might suggest a relationship between the two? The fact is, the Egyptian civilization seems to have been the chief example of a vast chasm between the haves and the have-nots, and they managed to do it longer than anybody else. I’m not saying anything definitive here, I’m just saying that Wilken’s book opens up a whole new way of thinking about things. How do we resolve this problem, the conflict between the ancient references to an “Egypt” that was home to great knowledge and the evidence of the spade? In a very real sense, finding that the original Egypt may very well have been in France and home to a Celtic or Druidic religion and culture restores to Western Civilization its true heritage, displacing the unnatural Fascist, Asiatic monotheism brought to us courtesy of Judaism. “…[T]he interesting thing is that, apart from the many details concerning the external activities of the priesthood (which any Jew in Jerusalem could easily see with his own eyes), the texts [of the Bible] do not contain any information about the structures, the organization and the other activities of the priestly class; it is like seeing only the front of a building. He then asks how it is that a ‘religion’ which attributes importance to liturgies practiced only in Jerusalem, which denies survival of the human spirit, could even have survived and spread, especially after the destruction of said temple. Iman Wilkens discusses the Celts and their culture to some extent, but what he presents is unfortunately somewhat colored by the Asiatic Henotheism. That is one of the few flaws of the book. We are taught almost nothing about the Celts in school, though they seem to be considered as the ancestors of most Europeans, thus also the majority of Americans. The question we need to be asking is: Why is it that the religion and culture of the Mesopotamian region dominates our lives and our culture when it is, in effect, “foreign” and truly anti-spiritual? Celtic vernacular literature, including myths, stories and poems, in its written form, dates mainly from the Middle Ages. It is based on oral transmission that goes far beyond the Christian Era. It is very difficult to get a clear picture of the pre-Christian Celts from the transmitted texts, not only because of the typical mixture of myth and reality, and the lapse of time, but also because the Roman empire sought to stamp it out starting with Caesar and continuing with the Roman (Frankish, actually) church under the influence of Christianity, daughter of Judaism. However, studying what is available closely, one gets the impression of a dynamic, somewhat undisciplined people. The Celts were proud, imaginative, artistic, lovers of freedom and adventure, eloquence, poetry, and arts. You can always discern the Celtic influence by the great artistic talents of these peoples. The Celts were VERY suspicious of any kind of centralized “authority,” and this is, in the end, what brought about their downfall. They could not stand against the hierarchical war machine of the Roman empire. In a sense, you could almost say that this is also how Hitler nearly conquered Europe, most especially France. Gauls take the principles of liberty and equality VERY seriously – right down to the common man on the street who in no way considers himself inferior to the Prime Minister. One of the principal historians of the Roman era, Julius Caesar, tells us that the Celts were ruled by the Druids. The druids “held all knowledge.” The Druids were charged with ALL intellectual activities, and were not restricted to religion, per se, which suggests to us that “religion” and “knowledge” were combined in a more or less scientific way, and were considered essential to one another – symbiotic. 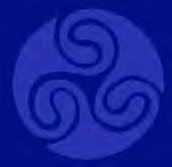 In their art, the Celts expressed their ideas that spirit was an interconnection of all things in life. This is evident in the art of Celtic knotwork. The lack of written texts by the Celts has been the greatest problem for historians and students of the Celts. A lot of ideas are “supposed” or ancient sources with agendas have been relied on, and some of them even propose that there was a “taboo” by the Celts on putting things into writing. But, if we look at what Caesar said was the reason for the ban on writing, we find that it was really quite logical. The Druids were concerned that their pupils should not neglect the training of their memories, i.e. the Frontal Cortex, by relying on written texts. It is worth noting that, in the nineteenth century, it was observed that the illiterate Yugoslav bards, who were able to recite interminable poems, actually lost their ability to memorize once they had learned to rely on reading and writing. Although the Druids prohibited certain things from being written down, it’s clear that they DID write. Celtic writings in Ogamic script have been found on many ancient stones. Caesar tells us that the Celts were using the Greek alphabet when the Romans arrived in Gaul in the first century BC. Plato is another who had doubts about the Greek origins of Homer’s work because not only do the physical descriptions in his poems not correspond to the Greek world, but also the Homeric philosophy is very different from the mainstream Greek philosophy we know about today which is also heavily influenced by the foreign Asiatic element. According to Homer, the philosophy of the ancient world was that there was a third element that linked opposing elements. Between the body and the soul, there is the spirit. Between life and death there is the transformation that is possible to the individual, between father and mother there is the child who takes the characteristics of both father and mother, and between good and evil there is the SPECIFIC SITUATION that determines which is which and what ought to be done. In other words, there are three simultaneous determinants in any situation that make it impossible to say that any list of things is “good” or “evil” intrinsically, and that the true determinant is the situation. The simultaneous existence of the third element does not mean that the notion of “good” and “evil” did not exist or was not reflected in the Celtic law. Their point seemed to be that there is no way to make “black or white” laws that must be followed by rote. A people must have wisdom to discern each situation and apply justice, not blindly, but with eyes wide open to the realities of the world and the specific situation. What was clear was that it was understood that nothing could be “cut and dried” in terms of law, that each situation was unique and the circumstances had to be carefully weighed. Aristotle considered Gaul to be the “teacher” of Greece and the Druids to be the “inventors of philosophy.” The Greeks also considered the Druids to be the world’s greatest scholars, and whose mathematical knowledge was the source of Pythagoras’ information. What we can discern from Wilken’s work is that there was an ancient and noble civilization associated with the European Megaliths that no longer exists and even its high knowledge and nuanced philosophy has been forgotten – except for the clues left in the Iliad and Odyssey. It is a fact that the Earth is literally blanketed with megaliths from some ancient civilization. Tens of thousands of them! There are variations in placement and style, but the thing they all have in common is their incredible size and their undeniable antiquity. It is now understood by the experts that the megalithic structures demanded complex architectural planning, and they propose that it was the labor of tens of thousands of men working for centuries. 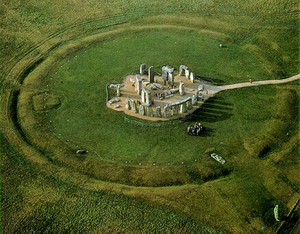 Stonehenge, the most famous megalithic structure. The interesting thing about the megalith builders is that the peoples who were able to perform these utterly amazing feats of engineering are still, in most circles, considered to be barbarians because they did not build cities, engage in agriculture, develop the wheel, or writing. Yet, they did something that clearly cannot be, and was not, done by “civilized” peoples who did all of those “civilized” things. They had some sort of “power” that we cannot replicate and do not understand. 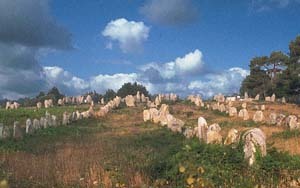 We also note that another of the famous megalithic arrangements is called “Carnac,” suggesting that Karnak in what we now call Egypt is but an echo of an ancient reality, a name transferred by peoples on the move from their ancient homes following a catastrophe, perhaps a terrible war such as that recorded of Troy. What is also found in the same areas are many sculptures of female goddesses found in the most ancient archaeological levels. According to the experts, the discernible idea of the religion of the goddess is that of an infinite bounty of the Great Mother. It is proposed that such peoples didn’t engage in agriculture because the idea of “owning land” may have been abhorrent to them. The idea of “forcing” the earth to yield, rather than accepting the natural abundance the Goddess provided was simply not a part of their philosophy. Their Goddess was a Star Being, and she was worshipped in outdoor Temples that were laid out along Celestial Archetypes. Iman Wilkens restores to us a fragment of True European History and perhaps it is time for us to turn our attention to trying to learn more about it in the proper context. After all, Judeo-Christianity has brought the world to the verge of total destruction in less than 2000 years. The Celtic cultures existed for many, many thousands of years, accomplishing great feats of engineering and producing a culture that was pre-eminent throughout the world until they were destroyed by the monotheistic infection – due mainly to the fact that they did not accept a single, monolithic authority. Iman Wilkens book is filled with rich details and piles of supporting evidence that includes ancient historic writings, accurate geographic and topographic description matching, detailed maps, countless archaeological finds, historic place name matching, cultural and linguistic evidence. This book is a MUST read for everyone, most particularly people of European and Mediterranean heritage.